Is your old clunker ready for the junker? Rollins Auto Wrecking, Inc will pull it, drive it out of your yard, and pay more so you can afford to put something down on a different vehicle. Running or not – here we come! Whether your old car runs or not, give us a call at 253-846-9393, because one man’s old junker, is the answer to another man’s affordable car repair prayers. 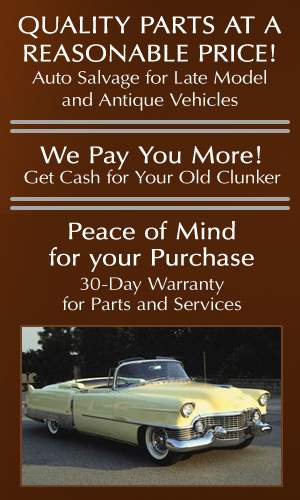 We pay more for your old clunker! CASH FOR CLUNKERS and we pay more. Call Rollins Auto Wrecking, Inc at 253-846-9393 or come see us 6 days a week.